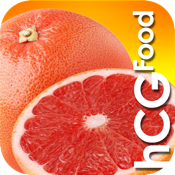 The hCG Food App is your new best friend! This great pocket app will keep you on track by enabling you to select the proper foods. On the hCG protocol only certain foods are allowed in each phase. This app was created following Dr. Simeons protocol and thus the criteria for what you will see is allowed and how much is reflected in that. The hCG Food App offers you an ever expanding 5,000 food database that sorts your food items so that each item that is allowed in the different phases is automatically brought to the top for you. This makes searching on the go, at the store, or at a restaurant fast and easy. The food database is easy to use. Type in what you are looking for or use our quick lists (which are foods broken down into sub categories) such as prepared meals when you are pressed for time. We have even listed certain food items under “limited” which means you can have them in moderation. This is helpful when you may be in a situation when you only have a few food options to choose from. We want you to make the best choices to help you reach your weight-loss goals. What we have also included is a link to our Facebook page. This is a great resource as it allows you to connect with other people using our apps and working through the diet. Whether you are from Idaho or from New Zealand you are able to use our app because you are able to select to have your food measurements displayed using the metric system or the English imperial system. Also, because we are always adding new food items to the database you can update the food list right from the app. No waiting for a new version update. If you ever have a technical issue with the app you can let us know right from the app. We have a great help desk that is open Mon-Friday. The app is colorful and fun to navigate. We wish you all great success in completing the protocol and we hope this app is the tool that helps you do so.